I’m a bit behind with my reading and only now starting to catch up with some of my favourite reads. 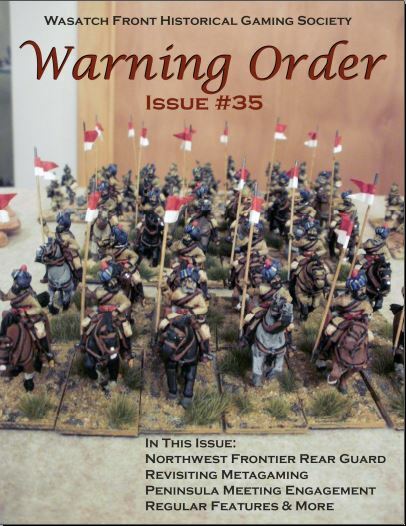 Warning Order is the Warning Order is the official online magazine of the Wasatch Front Historical Gaming Society (WFHGS) — a wargaming club. Yes, I had to read for an atlas (or at least Google Maps) to work out where Wasatch was. It is a free, full colour online club magazine that can be downloaded in PDF format. It is also a good read and generally there is something interesting in it. The WFHGS concentrates mainly on 15mm gaming for large games and skirmishes in 25mm. Apart from the 25mm, that fits with most of my gaming as well — at least where there are non-mechanized armies involved rather than navies, tanks and the other weird stuff I get in to. This issue has some Colonial action on the Northwest frontier, some Napoleonic action in the Peninsula, some Fire and Fury American Civil War, reviews and a reflection on the past. And for the record, Wasatch is in Utah, USA. WO is one of the best out there, thanks for sharing.